Skin of Neatform used to surface either 6mm / 1/4” or 9mm / 3/8” bending plywood materials previously attached to a framework. 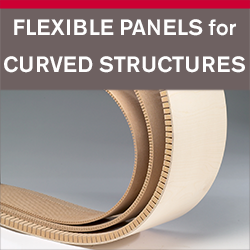 Improves conventional fabrication methods by eliminating the problems associated with the poor surface and inconsistency of bending plywood. 1. Fabricate a framework and cover with bending plywood using conventional techniques. 2. Cut the Neatform to rough shape and offer up to the framework to ensure a good fit, positioning the Neatform grooved face inwards unless making a feature of the grooved surface. 3. Following the glue manufacturer instructions, apply a coat of PVA glue or contact cement to the Neatform and bending plywood and finally position. If contact cement is used it is essential to ensure correct positioning is achieved first time because subsequent adjustment will be impossible. 4. Hold in position with clamps while PVA glue cures. Optionally, staples can be used to pin in position, while the adhesive cures. For further information on stapling see the section on fabrication tips. 5. Trim to shape and finish in the normal way.